Do Hemogram Parameters Correlate With The Level and Location of The Obstruction In Acute Mesenteric Ischemia Patients? 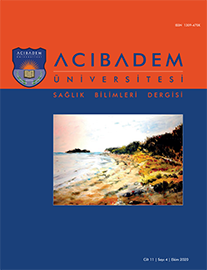 Marmara University, Pendik Training and Research Hospital, Department of Emergency Medicine, Istanbul, Turkey Background and Objectives: Acute mesenteric ischemia (AMI) is a disease with high mortality that needs early diagnosis and management. There has been a recent trend in the search for a fast prognostic tool for AMI. Hemogram parameters are widely used tools in emergency departments since they are inexpensive and fast. In this study our primary objective was to evaluate the significance of hemogram parameters in predicting the level of obstruction in superior mesenteric artery (SMA) and truncus coeliacus (TC). Our secondary objective was to evaluate the significance of hemogram parameters in predicting the location of obstruction in AMI patients. Methods: In this retrospective study, we reviewed medical records of 214 AMI patients including; hemoglobin, hematocrit, platelet, mean platelet volume, red blood cell distribution width counts and computed tomography scan results. Patients with missing data were excluded and 208 patients were enrolled. Results: Among 208 AMI patients, 123 (59.1%) were male. The median age was 68 (IQR: 59, 77). There were no significant differences between the obstruction level groups for the hemogram parameters neither in SMA nor in TC. The difference between obstruction location groups for hemogram parameters were clinically insignificant.